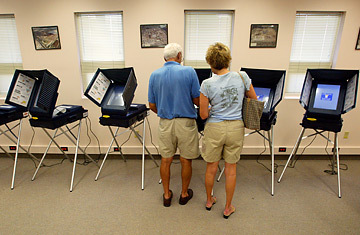 Voters using electronic voting machines in Delray Beach, Florida. It is hard to believe now what a darling touch-screen voting was seven years ago. After the Florida presidential vote recount debacle  which made traditional paper voting, especially the infamous "butterfly" ballots and hanging chads, look positively Third World  electronic voting was embraced as the way back from America's electoral humiliation. Some 50,000 touch-screen machines were bought in 37 states at a cost of almost a quarter of a billion dollars. The reversal since then couldn't be more stunning  as indicated by a bill in Congress introduced this past week by Florida Senator Bill Nelson and Rhode Island Senator Sheldon Whitehouse, which would ban touch-screen voting (also known as direct recording electronic voting, or DRE) in federal elections starting in 2012. "We have to start setting a goal on this," Nelson tells TIME. "Voters have to feel confident that their ballot will count as intended." After the initial excitement, it didn't take long for voters to lose trust in the new system, as they increasingly deemed DRE too complex, unreliable and insecure; the only thing worse than a confusing paper trail, it turned out, was no paper trail at all. (It didn't help that the main touch-screen machine supplier, Diebold, was widely accused in 2004 of ties to the Republican Party.) Fifteen Florida counties adopted touch-screen as well, and they learned the pitfalls of it the hard way, dealing with controversies like a 2006 congressional race in the Sarasota district, where an astonishing 15% of the ballots cast registered no choice at all  in a race that was decided by a razor-thin margin of 386 votes. As a result, Florida Republican Governor Charlie Crist moved immediately after his January inauguration to scrap e-voter machines and return the state to paper by 2008  to what he and most voter-rights advocates call the more trustworthy optical scan system. In that method, votes are marked on a sheet (which is retained for auditing purposes) and then electronically scanned. That system got a boost late last year when the National Institute of Standards and Technology, which advises the U.S. Election Assistance Commission, issued a highly critical assessment of touch-screen in favor of optical scanning." I get a receipt when I go to the bank or get gas," Crist told TIME, urging voting methods that provide a paper trail, "so why not for the most precious thing we have, the vote?" But the Nelson-Whitehouse legislation  which also requires routine audits in at least 3% of the precincts in all federal elections, and contemplates mandating paper-trail capability on any type of voting technology as early as the 2008 election  is the clearest sign yet of the stampede away from touch-screen. Its backers, like Dan McCrea, head of the Florida Voters Coalition, insist bills like this are necessary to get states to move to optical scanning, even if they are understandably reluctant to trash their investments in DRE. McCrea calls that foot-dragging the electoral equivalent of "buying a fleet of Pintos whose gas tanks you later find out blow up on you, but insisting you're going to keep using them because you spent all that money on them." The Nelson-Whitehouse bill would appropriate as much as $1 billion to help states move back to optical scanning (or any method that provides a reliable paper trail). "Unless someone can come up with a foolproof method of producing a paper trail with touch-screen machines, this is how we need to go," says Nelson, pointing out that attempts up to now to make DRE paper-trail compatible have too often led to printer paper jams and other "screw-ups." One of Nelson's consultants, Florida Secretary of State Kurt Browning, who oversees the state's elections, was himself an advocate of touch-screen voting as the elections supervisor of the county that includes Tampa. But since then, while he still believes the "DRE system itself" is sound, he acknowledges the system's margin for "the human error factor" has proven great enough to cause the new inertia. "There's not a lot you can do to mess up with optical scanning," says Browning. "We believe we're doing the right thing in Florida." But while Florida (which passed Crist's touch-screen ban this past spring) has given itself an almost two-year run-up to its 2008 changes, Browning worries many states may not be able to meet the paper-trail requirements by next November, particularly since the Nelson-Whitehouse bill may not even pass until well into next year. Browning, as a result, feels the 2010 elections may be a more feasible target  and would give states more time to simply get rid of DRE and bring in optical scanning rather than spending more money in 2008 to add paper-trail capacity to machines they'll simply have to trash by 2012. McCrea, however, points out that New Mexico voted to convert back to a paper ballot system in the spring of 2006 and had it ready by last November's elections. The Nelson-Whitehouse goals "are feasible," he insists. "It will be a challenge, but the voter fairness issue involved here is too important." Others point out, however, that the rest of the country may not feel the urgency that Florida, given its 2000 experience, feels with regard to election reform. Critics also politely suggest that Florida, considering its reputation for election mishaps, may not exactly be the model to follow in these things. But Floridians will just as readily suggest that their struggle to get it right makes them experts of sorts. Either way, whether or not the Nelson-Whitehouse bill passes, it looks as though Florida is leading the way back to the paper age.